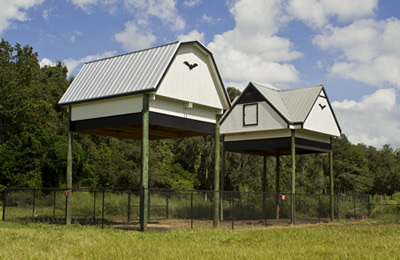 Welcome to the world's largest occupied bat houses. The most common species living here is the Brazilian free-tailed bat, Tadarida brasiliensis. The Southeastern bat, Myotis austroriparius, and Evening bat, Nycticeius humeralis, also live in the structures. The bats normally emerge during a 15- to 20-minute period after sunset, before total darkness on calm, warm evenings when temperatures are above 65 F. Bats may swoop near those observing the emergence to eat insects attracted to the carbon dioxide in human breath, however they will not attack or harm people when left alone. High winds, heavy rain or cold temperatures will keep the bats in the house for the evening. On warm winter evenings, the bats may come out for a drink of water at the lake and exercise; however they can eat only when bugs are flying.